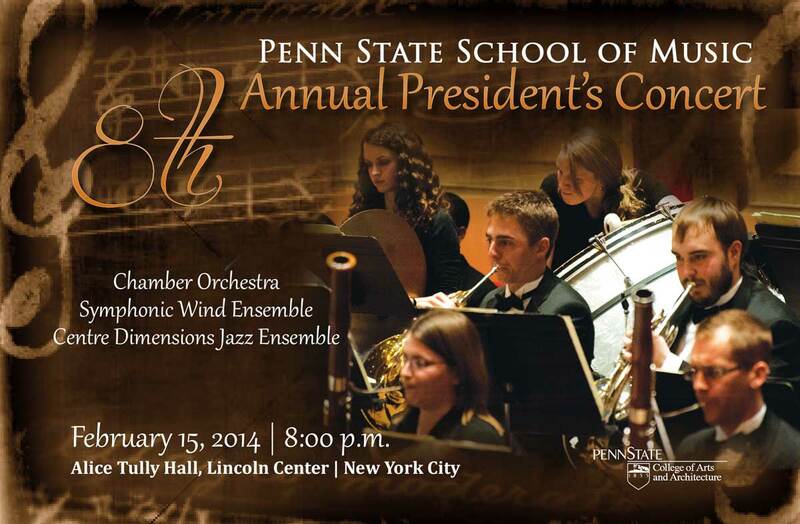 The Chamber Orchestra, Centre Dimensions Jazz Ensemble, and Symphonic Wind Ensemble will perform on Saturday, February 15, 2014 in the School of Music’s eighth annual President’s Concert, hosted by Penn State President Rodney Erickson. 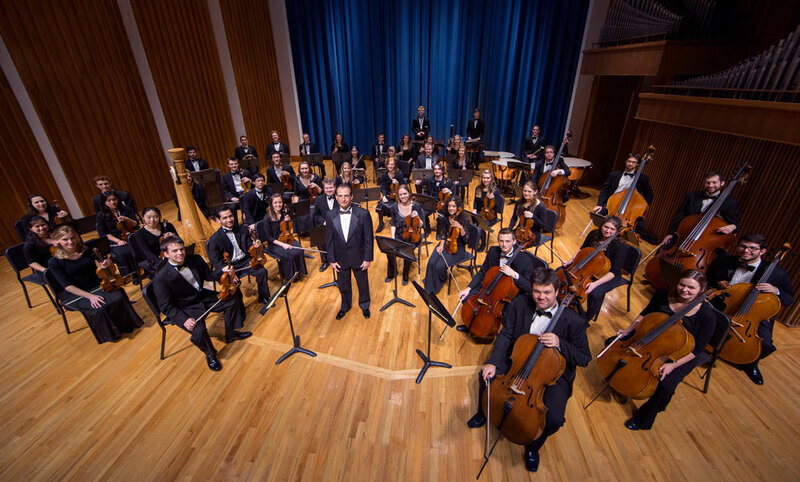 The Chamber Orchestra's program features two compositions inspired by dance; one a group of folk dances by Hungarian composer Béla Bartók, and the other conceived for the ballet by Igor Stravinsky. Highlights of the Centre Dimensions performance are original works and arrangements by Penn State jazz faculty member Dan Yoder. The Symphonic Wind Ensemble will conclude the performance with repertoire inspired by Manhattan, including Manhattan Roll by Robert Beaser, chair of the composition department at the Juilliard School, and Leonard Bernstein's Symphonic Dances from West Side Story. Prior to the concert, the Penn State Alumni Association will host a reception from 6:30 to 7:30 p.m. Enjoy hors d'oeuvres and a chance to socialize with fellow Penn Staters inside the elegant Hauser Patron Salon, overlooking the Alice Tully Hall Grand Foyer and New York City's famed Lincoln Center. Reception attendees are asked to use the entrance at 141 West 65th Street. A special concert seating area is reserved for pre-registered reception guests. Tickets for the concert and reception are $50 (per person) for alumni association members; $60 for non-members; $50 for children ages 6-17; free for children five and under. To register for the alumni association reception, please click here. Tickets for the concert only are $15 for the general public and $10 for students. Tickets are available from the Lincoln Center Box Office online here or at 212-671-4050. For directions and information regarding handicapped accessibility, please click here. We are pleased to provide complimentary tickets to music students and their families, and also to music teachers who are interested in learning more about majoring in music at Penn State. To receive complimentary tickets, please complete this online form. An ensemble of varying size as dictated by the repertoire, the Chamber Orchestra performs works from the eighteenth through the twenty-first centuries. The Chamber Orchestra has made three European tours. Repertoire from recent years has included works by Mozart, Copland, Haydn, Stravinsky, Schubert, Wagner, Mendelssohn, Ravel, Debussy, and Beethoven. Enrollment, open to all University Park students, is by audition at the beginning of each semester. The Chamber Orchestra is conducted by Gerardo Edelstein. Centre Dimensions, the premier twenty-piece jazz ensemble at Penn State, performs frequently on campus and tours throughout Pennsylvania and the East. In addition, Centre Dimensions performs and works with several internationally known artists each year. Previous guests have included Cyrus Chesnut (piano), Bob Mintzer (sax), Wycliffe Gordon (trombone), George Rabbai (trumpet, vocals), Frank Morgan (sax), Lynn Seaton (bass), and John Riley (drums). They perform a challenging repertoire of modern and classic jazz, as well as originals written by the director, Dan Yoder. This highly selective ensemble is open by audition to undergraduate and graduate students in all majors. The Symphonic Wind Ensemble is the premier wind/percussion ensemble in the School of Music. Conducted by Dennis Glocke, this highly select forty-member ensemble is comprised of the finest wind and percussion instrumentalists on campus. It performs a variety of repertoire ranging from chamber music to literature that utilizes the full ensemble. It concertizes both on and off campus and is open to all students, regardless of major, by audition. The President's Concert is jointly sponsored by the School of Music, the College of Arts and Architecture, and the Penn State Alumni Association.